Website vs Books? - Each have their own advantages and of course disadvantages. Having displayed website lists of motorhome stopovers for some years now the main disadvantage was that the very useful information displayed was only ever usable when online. 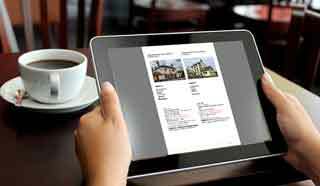 We have now produced downloadable eBooks that contain all the necessary information that can be used OFFLINE. 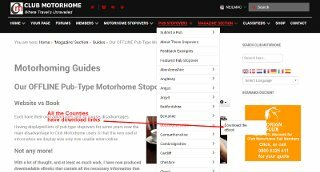 You simply download the ones that you want direct from the Club Motorhome website straight onto whatever mobile device that you use. Download them as often as you like to ensure that your copy is as up to date as the website itself. 1. PDFs are searchable. This means that the user can look for relevant information within the document without having to scroll right the way through to find it. For example, if you are at the cover page (or any other page) you could type something in the search/finder box and go straight to the information that contains that search text. 2. PDFs keep embedded information intact which means that when online (perhaps on wifi or using data etc) any hyperlinks (links) can still be clicked directly from the document. 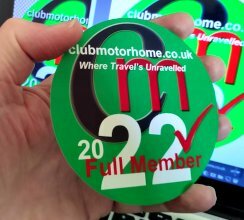 This in turn means that the way our information is listed it is possible to go straight from the document displayed on your device, to the actual listing on the Club motorhome website. 3. The documents can be printed off onto paper if really necessary, which in itself produces a useful hard-copy document but does not have the advantages of a pdf document. So, by in effect creating a 'book' there is then the disadvantage that an ordinary book has - which is that it can date almost immediately. However, by combining the two as above the ebooks can be downloaded as many times as the user likes and can take advantage of any updates whenever they are added and published to the downloadable eBook - it's still advisable to visit the main website where the information will always be most up-to-date. How to get the eBooks? 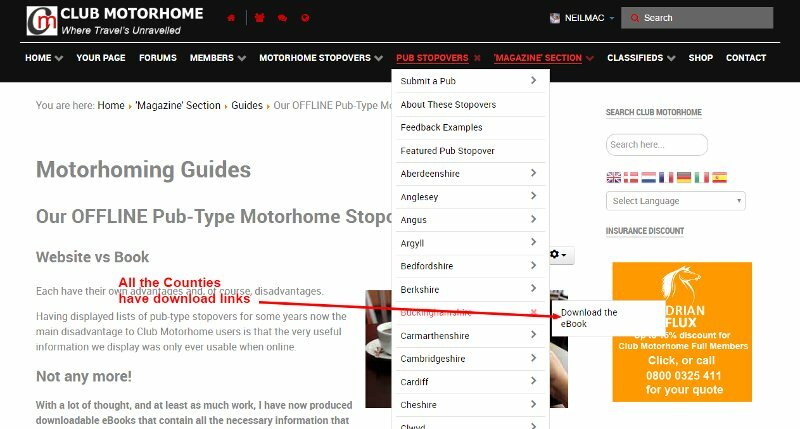 There is a free sample available for non-members of Club Motorhome to download for the pub stopovers in the County of Lincolnshire - this will give you an idea of how our eBooks work, try it and see! Only Full Members will see all the menu links so just click on the ones that you are interested in. Or, go to the chosen webpage itself and download your FREE eBook from there. Website vs Book? - With Club Motorhome's eBooks, you get the best of both worlds! So finally, how much does this all cost? The Lincolnshire pub stopover sample is completely free to anybody. The other Counties require full membership and no more! Just another great feature and benefit of Club Motorhome membership.